UK Prime Minister Theresa May stood up to update the House of Commons following her visit to Brussels, where she successfully made her case against Russia. "No other country has the capability, intent, or motive for the attack." Which failed still to provide actual evidence.. but one could argue - if one were so inclined - that Washington (or its NATO generals) have the capability, intent, and motive to undertake such a messy attack. 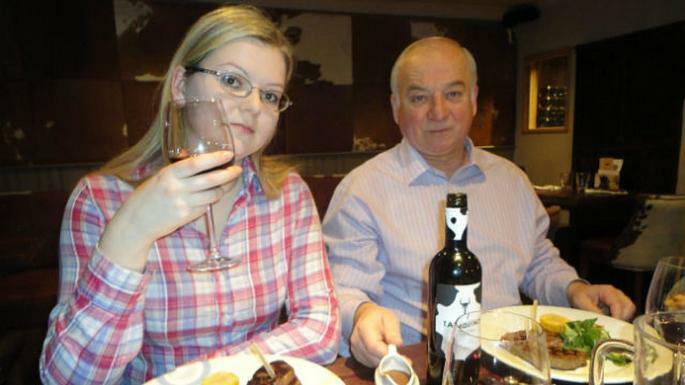 However, as May makes her case - ever more Colin-Powell-like - a Russian official claims that the United States was developing a similar if not identical nerve agent in the 1990s as the one which was used on Russian double-agent Sergey Skripal and his daughter Yulia Skripal. The claim was made by Igor Rybalchenko - head of the laboratory for chemical and analytical control of the scientific center of the Russian Defense Ministry, who says - without evidence (as are the UK's claims against Russia), that the A-234 compound in the "Novichok" family of nerve agents was published into a database maintained by the National Bureau of Standards (NBS). The substance was said to be heavy and volatile based on its molecular formula and molecular weight, and that it was also available at the UK's Porton Down laboratory. That said, due to the fact that the Novichok's chemical structure was never formally classified, according to Professor Alastair Hay at Leeds University, it's possible that the UK has some of the agent. It is quite likely that some government laboratories made minute quantities and storied their characteristics in databases, so that their identity could be confirmed at a later stage if found as an unknown poison in someone's blood, he adds. The UK has brushed off Moscow's allegations that it could have produced the toxin as "absolute nonsense," as the Kremlin has also made similar claims that Novichok has been produced in Sweden, Slovakia and the Czech Republic - all of which have denied doing so. Russia's ambassador to the U.N. has insisted that the development of Soviet-era nerve agents ceased in 1992, and that existing stockpiles were destroyed in 2017. Moreover, Rybalchenko says that the substance was added to the U.S. database by a member of the Army Armament Research and Development Center. In other words - you'll have to take his word for it unless evidence of the entry in the 1998 database surfaces. On Friday, French President Emmanuel Macron and German leader Angela Merkel said that following a meeting of the European Council, that UK PM Theresa May had shared "proof" of Russia's involvement in the assassination attempt against former Russian spy Sergei Skripal and his daughter, "convincing" the two leaders that Russia was behind the attack. What's a bit disturbing is that May's "proof" - which is being used to justify punitive action against Russia, has yet to be shown to the public. Moreover, the world leaders have all decided that Russia is "the only reasonable culprit." In other words, the Kremlin used a poison that would very clearly identify them as the culprits - instead of perhaps a more common and less attributable method of assassination. Makes sense if the plan was to get caught. Meanwhle, Russia's embassy in the UK has been demanding that London produce the complete UK info on "Skripal's Case" and disclose details on a program to produce weapons-grade toxic substances in Porton Down. The UK has so far refused to comply. As a result, Bloomberg reports that President Donald Trump is "preparing to expel dozens of Russian diplomats from the U.S." in response to the nerve-agent poisoning of a former Russian spy in the U.K."
Quoting two people "familiar with the matter", Bloomberg reports that Trump agreed with the recommendation of advisers and the expulsions are likely to be announced on Monday. And while the aides said that Trump is prepared to act, he wants to be sure European allies will take similar steps against Russia before he does so, which could be problematic since Russia controls roughly a third of Europe's natural gas supplies and thus the volume of any potential response (and also why despite "proof", Europe responded with nothing more than a harshly-worded statement). Among the advisors that Trump approached on Friday to discuss the matter were U.S. Ambassador to Russia Jon Huntsman, Treasury Secretary Steven Mnuchin, Commerce Secretary Wilbur Ross, Attorney General Jeff Sessions, Defense Secretary James Mattis, Director of National Intelligence Dan Coats, outgoing National Security Adviser H.R. McMaster and others. In other words, the West is now punishing Russia in an "open-and-shut" case with zero evidence released to the public for examination. What's weird is that Skripal, according to The Telegraph, was friends with an employee of Christopher Steele, the former U.K. spy who assembled the Trump-Russia dossier. If, as The Telegraph reported, Skripal assisted Steele in compiling the dossier - which notably relies on senior Russian officials, despite Steele never having traveled to Moscow - according to testimony by Glenn Simpson of Fusion GPS, it could explain the motive behind the assassination attempt in Salisbury town centre. Valery Morozov, a former construction magnate who fled Russia after revealing corruption, claimed last night that Col Skripal, 66, was still working, and remained in regular contact with military intelligence officers at the Russian embassy. That would raise the possibility that he was still feeding intelligence to people in this country. Go into your mind palace and consider something which may warrant at least a cursory investigation by UK authorities... If Skripal was friends with Christopher Steele's employee, it stands to reason that it's within the realm of possiblity that Skripal was Steele's source for the "senior Russian officials" cited in the Trump-Russia dossier. If Skripal was the source, anyone connected to the creation, funding or distribution of the Trump-Russia dossier would probably be OK if he disappeared and was unable to testify to his actions. Or, Moscow decided to get revenge on Skripal eight years after voluntarily giving him to the UK in a 2010 spy exchange - and when choosing how to assassinate the former (?) double-agent, the Kremlin used a nerve agent which would have led directly back to them.